June has not been a good month for Linden Lab, the creator of virtual world Second Life. A few weeks ago, the company announced that it was laying off 30 percent of its staff and taking Second Life into a new direction. 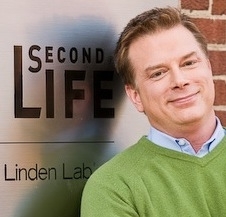 Today, Linden Lab is announcing that current CEO Mark Kingdon (pictured here) is stepping down. Company founder Philip Rosedale has been named interim CEO, and CFO Bob Komin has assumed the additional role of COO. The company did not give a reason for the reshuffling of the executive team but it’s safe to assume that it reflects Linden Lab’s new strategic direction. When announcing the layoffs in early June, Linden Lab also said that it aims to make SeconfdLife more browser based, eliminating the need to download any software. The company is also pushing for Second Life to extend to social networks. A breath of fresh air in terms of leadership may be a good idea. Second Life’s user base has been dwindling and clearly the company is trying to take the virtual world in the direction of social networks, after seeing the popularity of gaming on these platforms. Considering the company’s new direction towards building out a presence on social networks, Linden Lab is probably going to be embarking on a search for an exec with significant experience developing on these platforms. As we wrote in the past, Linden Lab isn’t completely dead. The company was reportedly valued between $658 million and 700 million a year ago. If Linden can turnaround Second Life and push the social agenda, the virtual world could rise again.